Going on a field trip as a chaperone is a far different experience from that of going as a student. I know I’m technically a “grownup” at 22 years old, but lord knows I felt a little ridiculous doing head counts and herding teenagers all day. I felt like the Chaperone Police would jump out and arrest me for masquerading as a responsible adult at any moment. On Wednesday morning, two history teachers, 34 15-year-olds, and myself hopped on a charter bus to Arromanches, the town directly in between Gold and Juno Beaches where “Mulberry B”, one of the portable harbors used during Operation Overlord, is located. We began our field trip at the local museum to hear more about the fabrication of the two mulberries and their transportation from Britain to Normandy. Mini History Lesson Alert! If you don’t feel like learning, feel free to skip this paragraph, but know that I’m shaking my head in disdain at you as you do so. I’ll know. Also, I’m not a history expert. I am a person who reads a lot and occasionally goes to museums. Please don’t take this as canon. Operation Overlord, the code name for the struggle to liberate Normandy after the initial D-Day landings (aka Operation Neptune), had to get supplies from somewhere. Well over three million troops would access France and the rest of Europe by Normandy’s beaches between June and December of 1944, and they knew that they would need immediate access to a port to transfer necessary equipment. Rather than capture an actual harbor, it was decided that the forces would simply bring the ports with them. The mulberries moved an average of about 9000 tons of supplies daily before they were destroyed during a major storm, and you can still see the remnants of the harbors at low tide. Arromanches is also home to the only cinema circulaire in Europe (you know, the type of movie theatre where there are screens all around you that show different images all at the same time). This one was full of powerful raw images of the Battle of Normandy, supplemented by strategic maps and pumping music mixed with Eisenhower and Churchill’s famous speeches. It felt almost like an action movie trailer until the very end, when I was forced to recall that the scenes before me were not of actors and guns with blanks in them, but rather, real kids being gunned down, and real people’s homes being blown apart. After a pique-nique lunch in the icy rain, because apparently Normand men don’t bother to care about planning things like where the children should eat on field trips, we got back on the bus to see the American Cemetery made famous in Saving Private Ryan and every other WWII movie ever made. When I was there last time I didn’t even realize that there was a museum on the property. Possibly because it’s funded by the US government, the museum was beautifully maintained, with accurate English translations on the plaques (these are sometimes hard to find in French D-Day museums) and stylized interiors. 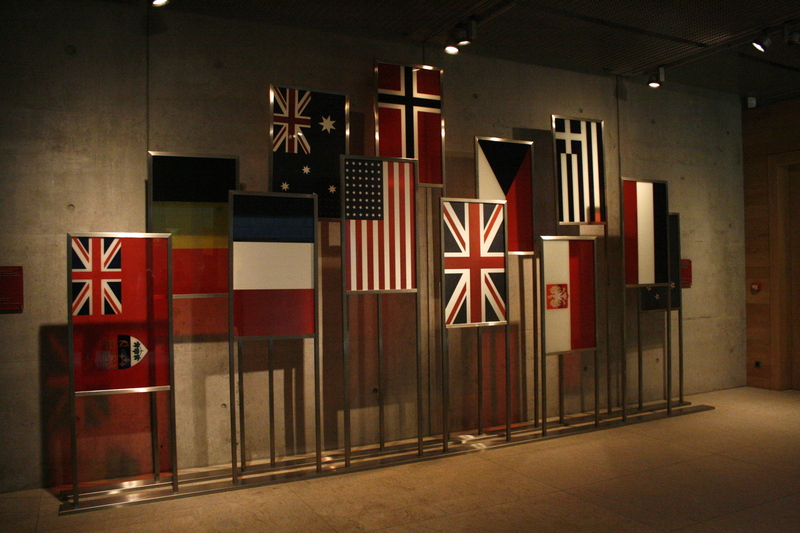 It was nice to hear American English being spoken around me by other patrons of the museum; I was tempted to talk to many of the older couples I saw passing through, but I kept to myself and continued speaking French to my incredibly bored students. They probably never realized there was a Southern girl in their midst! Our view during lunch after the cinema circulaire. Freezing and grey, but still pretty. While I’m not sure that the teenagers were deeply moved or even entirely conscious during our field trip, I had a wonderful time. It might not be so important to them right now, but I hope that some of the students will grow up and realize that they live in a region that is saturated in history and culture, and that that’s incredibly cool. I guess forced field trips aren’t the best way to cultivate any real passions among high schoolers, but I hope that one day a few of them will appreciate not only what was sacrificed for them during World War II, but the importance of knowing one’s history in general. turns out it’s just as not-fun for teachers! Even though it’s been a bit tough to wake up before 8 AM and focus the past few days, it’s been great to see everyone again and to have a delicious lunch cooked for me by the cafeteria guys every day. I’ve spent most of my classes recapping what we worked on before the break, as it seems that getting a holiday lobotomy is a universal ritual, but the students are pretty much back on track now that it’s Thursday. I also thoroughly enjoyed being interviewed by the local newspaper (!!) at a soirée that was organized by several of the high school administrators as a way for all of the assistants to get to know each other on Tuesday night. Good thing we’ve already been here for over a month and the seven of us already hang out all the time. Ah well, it was only exactly as awkward as it sounds, and at least we got free cider and cheese. I had a field trip on Wednesday, which will warrant its own post later on, but the rest of my week has been blissfully uneventful! All in all, a relatively smooth re-entry into the working world. Next vacation: 39 days until Christmas break!! The day to see and be seen by everyone in town, gather all of the produce needed for the upcoming week, and generally just stroll around the neighborhood. Today was super rainy, so I was afraid to take my nice camera to the market, but I promise that pictures will come as soon as I can get them. I didn’t need a ton of groceries this week, since I’ve still got quite a bit of leftovers in my fridge from the past few days. Last week, when my vocabulary skills failed me and I accidentally asked for a chou blanc instead of a chou fleur, I got saddled with a giant head of cabbage. Cabbage is something I’m pretty sure I’ve never eaten on purpose, let alone cooked, so I did what any well-adjusted, independent, young woman would do at this stage. Mom told me to open the windows, boil that stuff down with salt and butter, and hope for the best. Well, it worked, and luckily, it turns out that I like cabbage. I also used the leftover water for the base of a depression-era vegetable stock made by boiling up potato peels and the scraps of the past week’s zucchini, onion, and carrot odds and ends. Economical and delicious. I also roasted some sweet potatoes and cooked up some lentils, of which I have more than enough to last me for a few more days. It’s not particularly French to cook large batches of meals to eat throughout the week, but hey, I’m doing what I can. 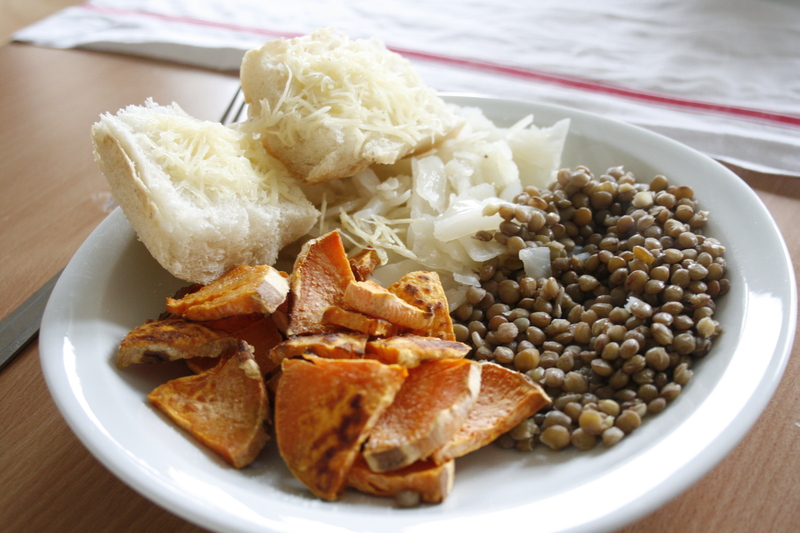 Boiled lentils and cabbage with roasted sweet potatoes and cheesy baguette. So, long story short, this morning’s trip to the market was more of a maintenance trip than a large haul, but you can still see what I got and how I’ll plan on using it. This is a bit of an unusual post for me, so let me know if you like it and if you’d like to see more of it! My haul from this morning’s market. 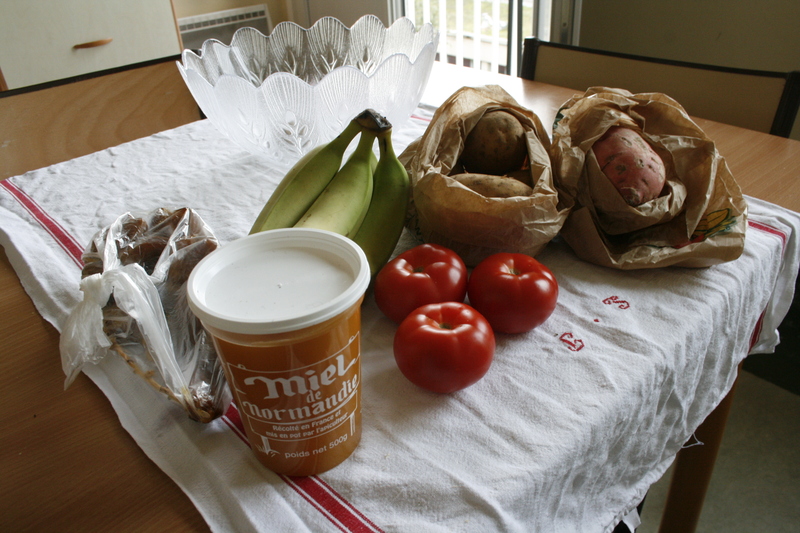 This all cost me almost exactly €10, or $13.50. With the addition of some individual yogurts and a baguette bought on the way home, I’ve got breakfast and dinner for the next week for under €15. My usual breakfast is a few cups of hot tea, baguette/jam or yogurt, and a piece of fruit. Dishes for dinners this week will include lentils and cabbage, pasta with homemade tomato sauce, mashed sweet potatoes, creamy lentil soup, and vegetable soup. Any ideas on other combinations I can make with some of these ingredients?